Pen-and-ink and water-colour drawing of the Kala Viaduct in the North-West Frontier Province by Sir Henry Yule (1820-1889) in 1860. 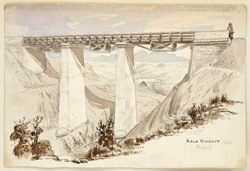 Inscribed on the front in ink and pencil is: 'Kala Viaduct. Punjab. 1860'.